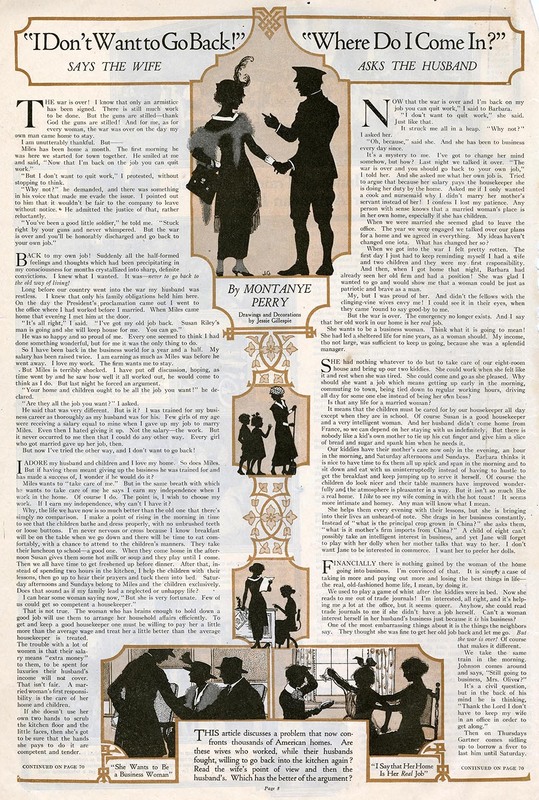 Jessie Gillespie worked in the strongly gendered mode of silhouette illustration, a holdover from 18th and 19th century folk practices that was put to use for decorative and satirical purposes in interior spreads of books and magazines, especially in the 1910s and 20s. Gillespie extended the visual vocabulary of silhouette to include value modulation and the integration of white detailing. She did so along with other illustrators like Helene Nyce, also profiled on this site. J. Thomson Willing, the art editor at the Associated Sunday Magazines syndicate, used to socialize with his counterpart at the old Life magazine, which was in the neighborhood, so this must have been around Herald Square, ca. 1908. I've forgotten the Life guy's name as well, but he was well known. Willing was known for "discovering" illustrators, and giving them a start, or a step into the big leagues: J. C. Coll, Charles Sarka, Grace Wiedershieim (Drayton), and many others. One day, the Life guy comes into Willing's office, and sees some silhouette drawings and remarks that these must be by his latest discovery, and when Willing is cagey about it, the Life editor pressures him to allow him to give this artist some freelance work. The drawings were by Willing's daughter, Jessie, and she was something like 16 years old. Willing was reluctant to turn his daughter professional, and was also concerned about nepotism, so they arranged it that she would do work using her middle name, Gillespie. I don't believe she ever did work for ASM, but she did tons of work for Life. It wasn't only her drawings; her captions and setups showed precocious cleverness. And she really understood women's fashion! One of my favorite items in the Reed Archive is an original silhouette ink drawing with elaborations and corrections in China white by Jessie Gillespie. Eight women converge on a sales counter, hunting for bargains. Above them a placard reads "Today only—49 cents." Their costumes and silhouetted forms are winsome and elegant—so much so that it takes a moment to notice the trampled boy, in stocking cap and sailor suit, lying face down on the ground, a victim of the rush for savings. This stylish, darkly droll image was created for Life Magazine circa 1912 by Gillespie. It's ripe for critical analysis. The image captures an early moment in the story of consumer culture—when clothiers and cosmetics makers began selling women a kind of luxurious intimacy, even as the battle for women's suffrage raged. The image exploits anxieties about self-involved females neglecting their maternal duties. Gillespie was a very talented illustrator, with great sensitivity to negative space, visual rhythm and graphic composition. She's best known for her work for the Girl Scouts of America, Association Men Magazine (for the YMCA), Ladies Home Journal, Life, and Vogue. She also illustrated books, including Ann of Ava and Soldier Silhouettes On Our Front, among others. William L. Stidger, the writer of Soldier Silhouettes (1918) uses Gillespie's shades as an editorial device to propagandistic effect. Stidger was a pastor and YMCA worker among the American Expeditionary Force during WWI. The YMCA set up and operated relief huts as a respite for weary troops. Although much of Gillespie's extant work involves silhouette, strictly speaking that's not all she did; she also painted fashionable women in colorful garments, typically isolated on color fields. January 22, 2018: I received a comment today (below) from Kim Munson, an art historian whose book From Panels to Frames: Comic Art in Museums will be published by the University Press of Mississippi Fall 2018. She provided an updated death year for Gillespie, who lived 46 years longer than our previous estimate (an error I cannot explain). "Jessie Gillespie Willing, magazine and book illustrator who was an honorary life member of the National Arts Club, died yesterday in Mountainside Hospital, Glen Ridge, N.J. She was 84 years old. Miss Willing received a gold medal from the National Arts Club in 1963. She bad been di rector of the National Institute of Graphic Arts. She also served as vice president of the Manhattan Protestant Council of the New York Diocese and president of the Women's Association of Grace Church of New York. She is survived by her sister, Mrs. Orrin F. Judd." Many thanks to Kim Munson for the updated information on Jessie Gillespie, and the considerable (!) correction on her lifespan. Learn more about Kim Munson at her blog, Neurotic Raven. Gillespie, ad for Holmes & Edwards silverware. Ladies Home Journal. June 1920. Jessie Gillespie, Today only_49 Cents. Ink and china white drawing for Life magazine, circa 1912. This image pays off Roger Reed's insight that Gillespie was keenly attuned to women's fashion. Gillespie, detail. The Darwinian spectacle of bargain-hunting. Gillespie, detail. A girl, neglected. Gillespie, detail. Little brother is trampled by the herd. Jessie Gillespie, accompanying illustrations for an article. Jessie Gillespie, accompanying illustrations for an article in The Sunday Magazine. Jessie Gillespie, illustration. Soldier Silhouettes On Our Front by William L Stidge. Published Charles Scribners' Sons in 1918. Reprint in 2015 by Facsimile Publisher, Delhi, India. The ghostly atmospherics of these images are striking and creepy. Jessie Gillespie, cover illustration for The What-Shall-I-Do Girl. Written by Isabel Woodman Waitt. Published by L.C. Page and Company in 1913. Jessie Gillespie, chapter header illustrations for The What-Shall-I-Do Girl. Written by Isabel Woodman Waitt. Published by L.C. Page and Company in 1913.